We had an unexpected snowstorm yesterday morning! We woke up to snow falling and snow on the ground. It continued to snow until 9:00 or so, while we were at my husband’s eye appointment, but by the time we got home the sun was out and the melt had begun. 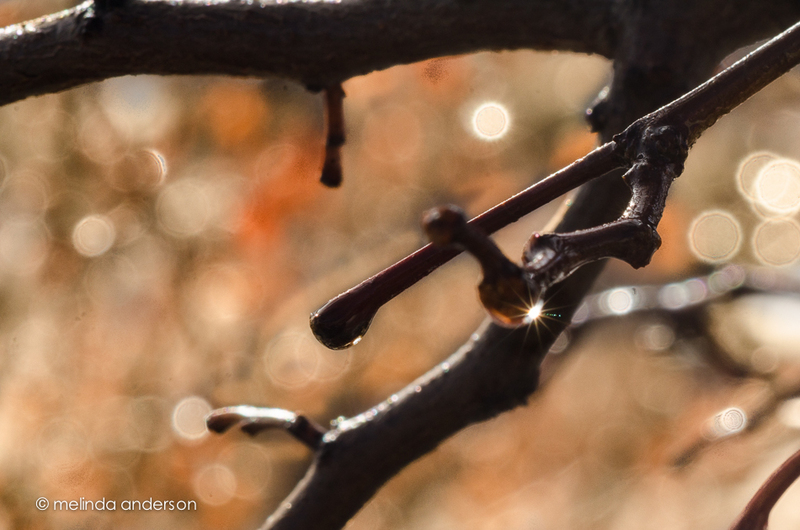 I raced outside with my Lensbaby Edge 80 with macro converters and managed to capture sunshine on the melting snow on trees and plants before it was all gone. I’m also posting another snow shot from a week or so ago, before the New Year’s snow melted away. This is one of our more quaint downtown establishments- I’ve never been inside, but it looks cute. It was shot with my iPhone and edited with Snapseed (an HDR treatment) and Mextures. 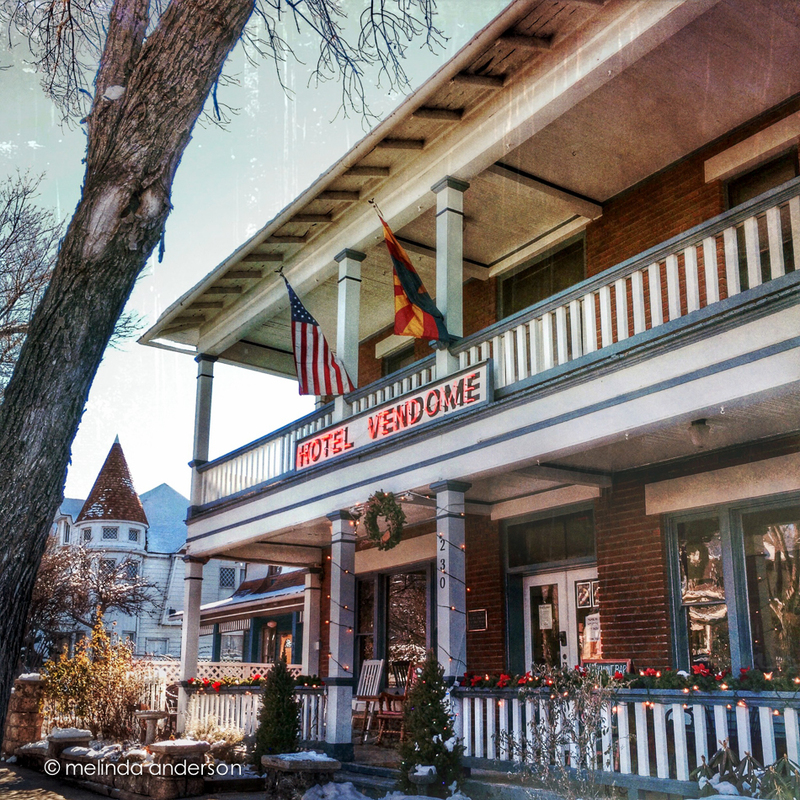 Linking up with Barb’s app-happy Wednesday at Keeping With the Times. This entry was posted on January 14, 2015 by Melinda. It was filed under around the yard, iPhoneography, macro, out and about, Prescott . Wow! Bokeh and starbursts together! I love both shots. The difference in coloring each is interesting. At first I thought the second shot was black and white then noticed the subdued colors in the background. That does look like an interesting place to visit. Love your lens baby shots. I have yet to get mine out this year. 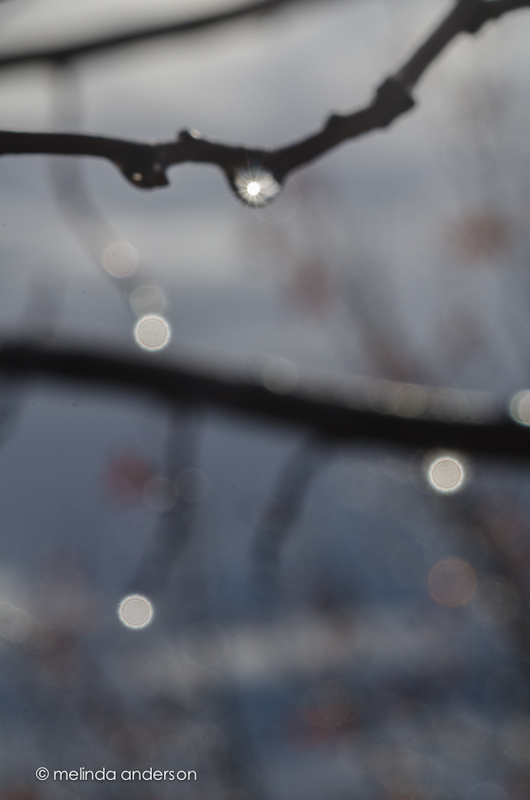 So pretty – love all of the watery sparkle in your images. Love the starbursts, very cool ! The hotel looks very interesting, I like the treatment you gave the photo. I love the bokeh so much, Melinda! Your work with the Lensbaby is truly inspiring! Thank you so much for linking up with “app” happy wednesday!